So how was it? Great. Even better than last time I think. Not only because of the location being on Islay itself, somehow I also found the content more appealing. But let me start at the beginning. Having set the reminder this morning I left work on time this afternoon. 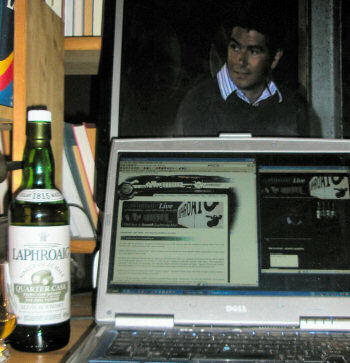 Having arrived home with plenty of time I picked up my bottle of Laphroaig Quarter Cask (my favourite expression), opened some Hachez chocolate and at about 19:55 pointed my browser to the Laphroaig Live Whisky Tasting site to wait for the transmission from Islay. Before the webcast started we were given an introduction to the distillery and the island, a nice touch I think. Then the actual webcast: The ‘regulars’ John and Robert were good, as to be expected. But I felt Martine really shone and almost put them in the shade. Apart from the Whisky Chef and a Winter Storm on Islay video I had never seen anything of her before. To me she really brought the webcast to live, talking about the flavours and how to mix it with food. John and Robert brilliantly supporting her, reacting to her thoughts and ideas. Some people might find the idea of an online whisky tasting weird, after all you won't have many (if any) of the whiskies to hand yourself. While I can understand where they are coming from I didn't really find that a problem. I will never be able to taste the nuances John, Robert and Martine are able to taste, but I found it interesting to hear them talking about it and describing it. Picture quality was excellent throughout. Sound was very good as well, although I had some strange drops in quality occasionally. Not sure if that was just my system or a general problem. 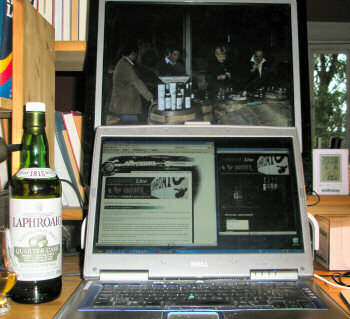 If you missed the webcast (or would like to see it again) you will soon be able to watch it on Laphroaig TV. Recommended viewing either way.